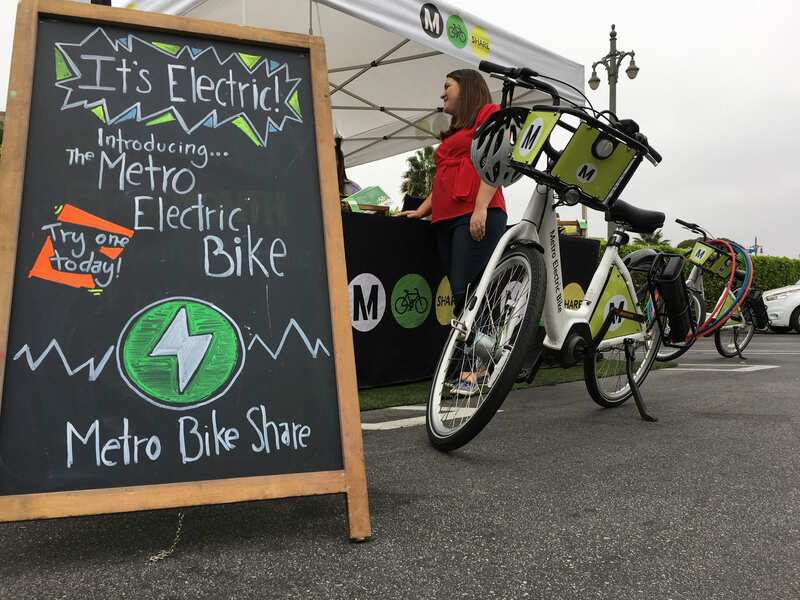 In order to make biking easier for some customers, Metro Bike Share is adding 10 electric bikes to its fleet beginning today — with those bikes mixed into the Metro Bike Share network in downtown Los Angeles. That includes the Bike Share station on the Alameda Street side of Union Station, where there is a booth set up today until 1 p.m. This is a pilot program for the next three months. If the bikes prove popular, more electric bikes could be added to the system. The Metro Electric Bike uses an electric motor to give riders a boost and can reach speeds up to 17 mph — making it easier to climb hills and get around town without breaking a sweat. A screen on the handlebars shows speed and the battery life remaining on the bike. Metro will monitor the bikes and keep the batteries charged. Ready to give it a try? Look for the green lightning bolt on the Metro Bike Share app (Google Play or Apple App Store) to find a bike share station with an electric bike. Customers who complete a ride on an e-bike will have the opportunity to provide feedback to Metro via a short survey that will be emailed to customers. To find out more about the program and get riding please visit bikeshare.metro.net. This might actually work to get more riders…..
Why wasn’t this done from day 1?? Are these pedal assist or throttle? These are pedal assist bikes. These are really cool i tried one the other day. You can pedal or kick it on to electric to assist you. But how long does the charge last?